You’re a beefy hunk. When you do fantasy cosplay, or some intense LARPing, you’re not the type of guy who’s going to settle for being some ordinary human, or one of those frail elves. You’re not going to get stuck playing some kind of goofy ogre either. No, you’re going to cosplay as the beefiest, hunkiest fantasy creature of them all, the centaur. That’s right, half-horse, half-man, and one-hundred percent beefcake. Of course, you’re going to need to do something about that lower half of yours, since it needs to be a little more “horse” and a lot less Homo sapiens. We have you covered though. 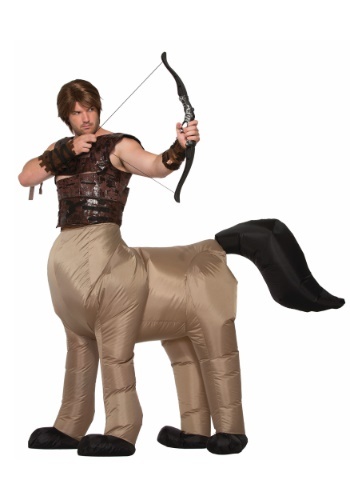 This Inflatable centaur costume for a adults helps you look like a buff fantasy creature, ready to be the man… er horse-man of any LARPer’s dreams. Oh yes, this Centaur costume is a true masterpiece. It comes with an inflatable fan that does all the work, so all you have to do is stick those wiggly do-dad legs of yours into the costume and you’ll be looking like a full blown (pun completely intended) centaur! It has some great details like hooves on the feet and a nice big horse tail in the back. Now, everyone knows that centaurs are manly warrior types. That means that you’d better make sure to come packed to the teeth with toy swords, axes, bows and spears, since every goblin, orc and merman in a five mile radius is going to be completely jealous of your rad new bod and you’ll have to fight off each and every one.